My performance in Amsterdam’s first String Quartet Biennale festival of Schoenberg’s second string quartet with Cuarteto Quiroga (on a concert also featuring Cappella Amsterdam in a world premiere of José Maria Sánchez-Verdu) will be broadcast live on NPO Radio 4. On February 1st at 8:15 pm Netherlands time, tune in to hear a live stream of the concert. Update: if you missed it, you can listen back here. The Schoenberg starts at 1:38:30. 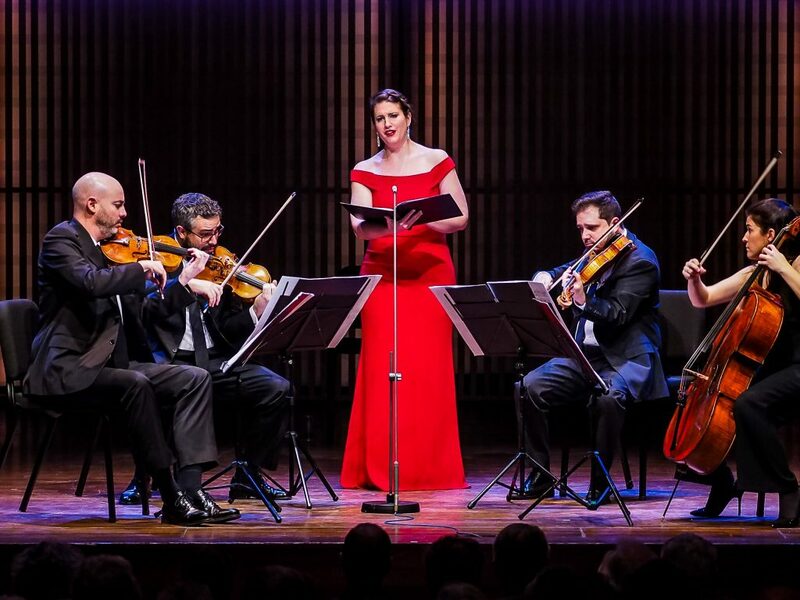 Singing on the festival (in two performances–I also sang Golijov and Caroline Shaw on a concert with the Ragazze Quartet and my Damask compatriot Marine Fribourg) was a complete delight. The organization was flawless, the programming endlessly interesting, and all the conversations I had with other musicians got my creative pistons firing like crazy. A compliment from one violinist in the legendary Emerson Quartet turned into an email exchange about his compositions for soprano, which I would love to program. The artistic director of the festival, who has been a dear friend, ally, and cheerleader since she heard me in my first West Cork jump-in several years ago, was open to my most far-reaching suggestions of repertoire–nothing was too weird for her, or logistically impossible; she really did want the artists she loves most to suggest their coolest ideas, which resulted in an incredibly diverse line-up of pieces, performance situations, and ways to experience the sound and energy of the quartet unit. I heard talks of both Alfred Brendel and Alex Ross, and I left every day of the festival with my head spinning with inspiration. I knew the Ragazze Quartet already and love working with them–their creativity, open-mindedness, and fun and dramatically concentrated energy in performance are unmatched. But I also fell in love with a new group of collaborators, the Quirogas; their empathy (personal and musical) for each other, me, every prompting in the Schoenberg score, and for the possibilities of sound and color and emotion in performance, were awe-inspiring. I have performed the gorgeous Schoenberg a number of times before, but I felt I understood the score better, could take more risks, and also could be more sure of realizing the incredible beauty of the piece as notated, than ever before with these lovely four humans. It was a week I won’t soon forget, and I’m so grateful to be a collaborator and contributor at a festival of this level. It brought me (and many others) a sustained period of absolute, unadulterated JOY at being a musician–and a special sense of how lucky I am to be a singer that does chamber music; there aren’t too many of us. I can’t wait for the 2020 edition, already in the planning stages by the indefatigable SQBA team. © Katharine Dain 2018. Where uncredited, photos used in page content are by Evelien van Rijn or Arthur Moeller; complete photo credits can be found here.